Former Miss Zimbabwe contestant Pauline Mapuvire never got to wear the coveted crown. She was always picked as either first or second princess. The 36-year-old’s modelling talent may have failed to reach where she expected, but her social and family conscience are just as strong. Mapuvire is an Oriel Girls High alumni where she was in the same class as Mrs Marry Chiwenga -now the Miss Zimbabwe Trustlicense holder and former Miss Zimbabwe Phoebe Monjane. It was the same school that produced other Miss Zimbabwe queens in the likes of Linda Van Beek, and Angeline Hundah nee Musasiwa. Even long after she quit professional modelling, she has continued with charity work. It was by chance that she ventured into caregiving. “It was one day that I was watching ZBC that I saw a child who was suffering from Xeroderma Pigmentosum and she was from a poor background. “I immediately led a campaign to fundraise for the child and the money we raised through mobile money service was not enough. 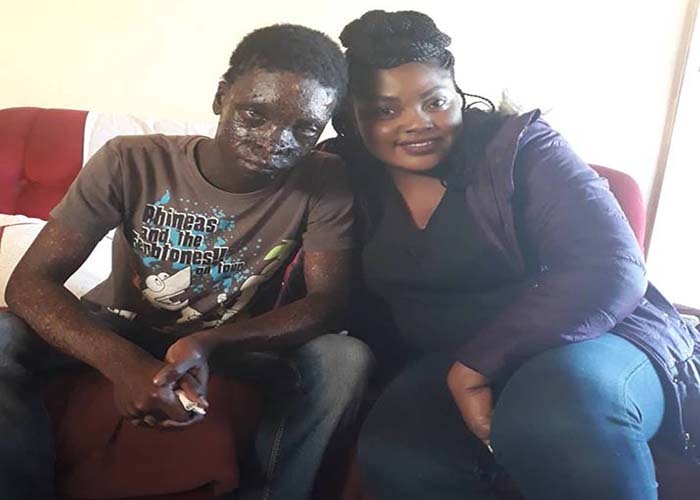 I then decided to use my own resources to make sure the child was not only treated but also taken care of,” Mapuvire said. Soon after the fundraising campaign, there was a second child who also needed the same kind of assistance. “Before I realised it, I had three children with the same condition who needed assistance and the numbers kept growing. From just three now I have 33 children who suffer from Xeroderma Pigmentosum,” she said. With the increasing number of children who needed assistance, this birthed the idea to form Xeroderma Pigmentosum Family Support Zimbabwe in 2017. “The idea was to raise awareness and fundraise for the children who had this condition. “For me, this was an opportunity to continue with charity work since I have been a model,” Mapuvire said. Up to date, the organisation has assisted 33 families whose children were diagnosed with Xeroderma Pigmentosum. According to online sources, Xeroderma Pigmentosum or simply (XP) is a genetic disorder (autosomal recessive) in which there is a decreased ability to repair DNA damage such as that caused by ultraviolet (UV) light. Xeroderma pigmentosum is caused by mutations in genes that are involved in repairing damaged DNA. DNA can be damaged by UV rays from the sun and by toxic chemicals such as those found in cigarette smoke. Normal cells are usually able to fix DNA damage before it causes problems. The life expectancy of a person with xeroderma pigmentosum is shortened for many individuals with XPA due to the dramatically increased risk for skin cancer and risk for neurodegeneration. The average life expectancy of an individual with any type of XP with neurological features is 29 years (37 years if neurological features are not present). The condition can be cured by getting regular check-ups for precancerous growths (actinic keratosis) is very important. This can help to reduce the incidence of skin cancer and end the need for more invasive surgeries. There isn’t a cure for XP, but its symptoms can be managed. However, XP is not contagious and at times can develop into cancer if not treated. At present Xeroderma Pigmentosum Family Support Zimbabwe is making efforts to ensure that the children mostly the ages 9 to 25 are treated and taken care of. The non-governmental organisation is also making efforts to ensure that there is a home for children with XP. “We are working with the Health and Childcare Ministry as well as Harare City Council with a view to open a home and also a hospital that specialises in treatment of XP. “We are happy that we are making progress in that regard with the Health and Childcare Minister recognising the organisation,” Mapuvire said. The organisation has done more than providing funding to the XP patients but it has also connected the Zimbabwean patients with the rest of the world. “We are getting support from other XPs in countries like UK, Australia and the like. These organisations are providing protective clothing and sun screens to the children,” she said. Mapuvire said as an organisation they realised that it was expensive to send children suffering from XP for treatment outside the country. “One would need up to $60 000 to go for treatment outside the country a situation which is not sustainable so what we said an organisation was to ask for Government and the Harare City Council to provide facilities and land where these children can be housed while they get treated,” she said. Due to lack of funding, Mapuvire said she uses her limited resources to reach remote areas where she visits children with the disease. “This is what I love to do and I am not looking at getting rewarded but a sense of duty,” she said. Mapuvire who is married with three daughters applauded her husband for the support. “My three daughters have taken after me and whenever they see a child with XP they take their number and hand it over to me. I usually go with them to wherever place we visit the children with XP and they are not afraid. A lot of people fear to get contact with children with XP and yet it is not contagious,” she explained. Although Mapuvire did not become the face of Zimbabwe where she could get have gotten a platform to practise her philanthropy, she listened to her big heart and has been impacting many little lives.